Reading wind speed and direction from the lay of the isobars on a weather map is a basic skill in marine weather. We need it because surface analysis maps only contain spot winds from observations and forecast maps only include winds greater than 34 kts. On other parts of both maps we are left to deduce the corresponding wind from the isobars alone. The ubiquitous use of GRIB formatted weather forecasts has dampened the motivation to learn this skill because looking at one of these forecasts you can turn on and off wind and isobars at will to see the correlation, and if that is all we used we would not need to know more. But that is poor policy to rely on these GRIBs alone; for most effective analysis and forecasting we need to look at the actual maps made by the NWS, and to read these we need this skill. Even with GRIBs at hand, it is valuable to see if the correlation makes sense or not. The procedures are discussed in Modern Marine Weather and we have several videos on the subject as well. The most challenging part is usually figuring the speed of the wind, which takes either tables or a formula (Section 2.4 in our text), on top of reading latitudes and distances carefully from the map. The wind direction should in principle be easier to determine, but we have found there are still some cases where the in-principle easy solution can be evasive. Thus we take here an all new approach to resolving this that relies only on the Buys Ballot Law. This should work in all cases the same way. 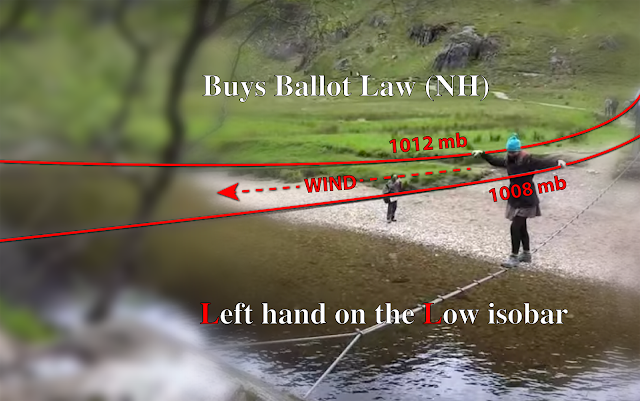 Normally we started with the rule that wind flows (in the NH) clockwise around Highs and counterclockwise around Lows, and assumed that is all we need to figure the wind direction at any point on a map. But when we do not know where the local Highs or Lows are located it could be distracting. Here is the short depiction, followed by a (probably longer than needed) video showing it in action. In the Southern Hemisphere, the wind circles the other direction so the hand are reversed... but don't even think about that now. Here is then how you can follow up on choosing the wind direction more precisely. (1) Plot the point you care about on the map. (2) Through that point sketch in a new isobar that is parallel to the isobars on either side. (3) Draw a line through the same point that crosses your new isobar at an angle of about 20° pointing toward the lower pressure. These three environmental sources surveys cover key resources available to mariners who have not taken our Marine Weather Course, which covers each of these in depth, along with the background needed to use them efficiently. Our goal here is to be sure that you do not leave one of our other courses without at least knowing what the basic tools are and how to find them. All three surveys (weather, waves, and currents) take advantage of viewing forecasts or actual data in GRIB format using dedicated GRIB viewing software or a navigation program with that functionality. A discussion of those programs and sources of GRIB formatted data are in the Weather Survey, so that one is needed to understand the Currents Survey and Waves Survey. For US coastal waters, we have a rough starting point on waves with the statistics in Appendix B to each Coast Pilot in a section called Meteorological Data. For all US coastal waters they list the "percent frequency" of winds > 33 kts, seas > 9 ft, and visibility < 2 nmi, with the caution that these data are based on observations from vessels that may have avoided bad conditions, and therefore these are minimum numbers. They do though clearly show how these data vary month to month along the coast, which could help in choosing a voyage time. We can access wave forecasts graphically in the OPC forecast maps called "wind and waves." There is a 24h, 48h, and 96h forecasts. See near bottom of this page for the Pacific. The 24h forecasts cover different regions than the 48h and 96h, which is the same with weather forecasts. Farther down the page they show color graphics, which are direct model outputs. The wave maps can also requested by email via saildocs or FTPmail as explained in the Weather Survey. Click WW3 to show regions available, select a region, then the model runtime, then the time span of interest. There are three parameter combinations to choose from. Here is a good place for a reminder about sea state definitions. The word "waves" can mean anything, i.e. any one of the following specific types, or even combinations of them, which makes it obvious that if we want to be clear in our communications we should chose these words carefully. Wind waves are those caused by the existing wind. Generally they move in the same direction as the wind, but for new wind shifts it can take half a day or more for them to get in alignment… and for a moving system they may indeed stay out of alignment to some extent. There is always a statistical distribution of wave heights, wave periods, and wave lengths, and wave widths—meaning the horizontal extend of a wave in the direction perpendicular to the way it is moving. 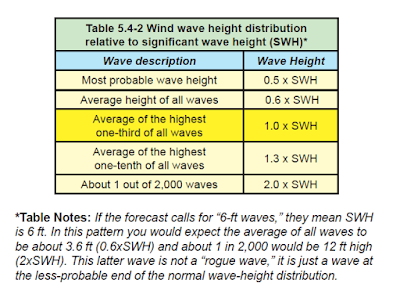 Wind wave distributions are characterized by the significant wave height, defined as the average height of the highest one third of all waves. The table below shows how other stats can be tied to the SWH. 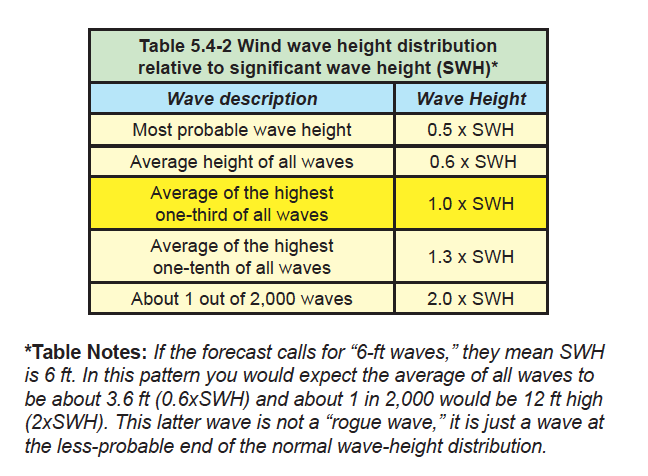 Wind wave forecasts are generally given in terms of SWH. Swell waves are those caused by distant storms. They have out run the systems that created them and they proceed across the ocean. As they proceed from their source they get organized into a near constant height and length, and as they proceed the height gets lower the length gets longer. Longer waves means longer periods, being the time peak to peak time it takes one to pass. Average wind wave periods are some 7 seconds; swells are longer, up to twice that or more. Combined seas means wind waves plus swells. SWH can also be applied to the combined seas. As you look over the WW3 forecast images, you will see wind waves and swells forecasted. Check out their heights and periods across the maps to see how all this works. A look to the corresponding weather maps shows the sources of the waves. As is the case with ocean current models, noted in the Currents Survey, there are internationally several models providing sea state forecasts, but there is one dominant one, made here in the US that is the most popular for global coverage, the WW3 model. This is essentially the only one we need. WVPER = period of the wind waves. Samples of the these data are shown above. WW3 is updated every 6h, and gives forecasts out to 7 days, starting at every 3h, then in larger steps. Resolution is 0.5º, but we may not need that and can ask for 1º to save air time. For those who do not have time for our full Marine Weather Course, we have available our textbook Modern Marine Weather and our Weather Workbook for study on your own. We have a page dedicated to ocean and coastal currents at http://www.starpath.com/currents. It is extensive, but not well organized as an introduction, and it covers more than we need now. So we make this list. (1) Climatic ocean currents are given on pilot charts, which you can download from links at http://www.starpath.com/navpubs, monthly by ocean. Pilot charts are historically the mariners first guess of what current to expect. There are several models that do global ocean current forecasts, but we will stick with the most popular one RTOFS, which is likely as good as any of them. (1) See graphic forecasts online at http://www.opc.ncep.noaa.gov/Current_fcasts.shtml Note that this site gives NCOM as well for adjacent US waters, and they only show RTOFS for the Northern Hemisphere, but you can use RTOFS for all waters. And that is good, because the RTOFS digital data is readily available, and only special programs can access the NCOM data. (2) You can request and view digital RTOFS current forecasts in Zygrib, LuckGrib, OpenCPN, and other programs. Most ECS, and indeed most ECDIS programs will display this data. For the ECDIS apps you may have to provide the data yourself, see (3) below. This gets you the currents and seawater temps in 3-hr steps out to 72 hr, for the lat-lon box indicated. the 0.08 part is a fixed notation for the resolution. See saildocs.com for more specs. You can request and get this file now, but you need a grib viewer to see it. if using Zygrib or LuckGrib you can ask for this from within the program and do not need this external email. (4) To view historic images and animations of global currents see this comprehensive Navy Link. Generally this link will require you to give your browser permission, so say yes every where, then you have a real encyclopedia of currents around the world. These installations are mostly in US coastal waters, but there are a few stations overseas as well. Marine weather is essentially all about the wind. Wind determines our progress, power or sail, and wind makes the waves, the ultimate threat to vessels at sea—a cubic yard of water weighs a ton. We typically only care about things like temperature, precipitation, clouds, etc, to the extent they help us understand or forecast the wind. We have a couple articles online including another weather overview as well. See in particular the weather checklist. This survey here is a more generic sources survey. For long term route planning around the wind, the primary source of climatic wind data is COGOW. This essentially replaces the pilot charts or any other wind atlas for climatic wind prediction, though we still look to the pilot charts for other crucial planning data. This is a must-know source of wind data. If we need more specific historic data this can be found in what was recently called the National Climatic Data Center (NCDC), but is now part of the National Centers for Environmental Information (NCEI). You can get almost any past weather data from this site. For short term planning—do we leave today, tomorrow, or next week—and for decisions underway (a crucial part of marine weather), our main source of data are the various Centers of NOAA and the NWS. It is difficult to keep track of their organizational structure, which is as fluid as the wind and sea they cover. Here are the key ones and where to find them at the moment (they are in the process of changing again). These three above provide analysis, forecasts, and observations. Again, it is fundamental to know these three agencies and the many products they provide. We are also dependent on two other complex entities that produce key products we need for weather work underway. National Center for Environmental Prediction (NCEP), and in particular the Environmental Modeling Center. NCEP runs the numerical weather prediction models that we rely on underway for wind forecasts. We can go their link above and see graphic images of the model computations, but the main products we get from this agency are delivered by other means to us in the form of digital GRIB data, discussed below. For US inland and coastal waters mariners are increasingly using the digitized NOAA forecasts known as the National Digital Forecast Database (NDFD). These forecasts are based on a compilation of the best forecasting available from the NWS along with the National Blend of Models to come up with a NWS forecast in digital format. This program is implemented by the Meteorological Development Laboratory, but we get the fruits of their work from another agency outlet in GRIB format. The model forecasts and the NDFD data are viewed underway in GRIB format. This is a special vector format that provides extensive forecasts in small files that are easy to download by satphone or HF radio underway. There are many notes on this in the overviews cited above, but the best way to get involved is to install one of the programs and start using them. There is a free program for Mac or PC called zyGrib, which is one good way to start. If you use a Mac, then there is a fantastic $20 app called LuckGrib, which is the state of the art GRIB viewer and source of GRIB files. For global winds, the best starting point is the GFS model, which is available to mariners in any GRIB viewer and also on essentially any navigation program. A free nav program called OpenCPN is a good way to start if you have not used electronic chart navigation in the past. OpenCPN includes a versatile GRIB viewer and there is both Mac and PC versions. Later there are commercial products that one might want to consider based on personal preference and goals. Expedition, for example, is the choice of competitive racing sailors. See also our Notes on GRIB Viewers. You can also request GRIB files by email from saildocs.com. We have extensive notes on this in our textbook and online, starting at Weather by Satphone and included links. Of the many articles we have online about weather, I point out this one if you sail in hurricane or cyclone zones. Tropical cyclone alerts by email request. This is crucial as these text alerts are the primary source for weather near tropical storms. The official weather maps are not useful for this, and the GFS model data are not dependable for these systems—on the other hand, those with NDFD data will get more useful results in GRIB format, but the text alerts from NHC remain the primary source. Modern marine weather is a broad topic these days, incorporating all we know traditionally from wind, sea, and sky, along with the latest technologies which are vast and evolving.